The entrance to the Team Aqua Hideout in Lilycove City in Sapphire and Emerald. The team aqua hideout is positioned outside Lilycove City, and is available only in Pokémon Sapphire and Pokémon Emerald. If you are playing Pokémon Ruby, you will instead find the Team Magma Hideout at this location. 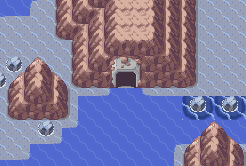 The cave is found just north of where the aqua member is trying to teach Wailmer to jump. Inside the base you must use teleports to move around the various rooms. Make sure you use all of the teleport because there are very valuable items in some. For example, one room contains a masterball on the floor, and there are also also two chances to capture an electrode on level 30. At the end, an Aqua admin is waiting by some water and says that his job is to hold you off while his leader (Archie) gets away in the stolen submarine. This page was last edited on 25 November 2018, at 20:10. This page has been accessed 95,775 times.